This tutorial will show you how to install and configure the latest version of WordPress 5 on top of a LAMP stack in Debian 9 - Stretch. 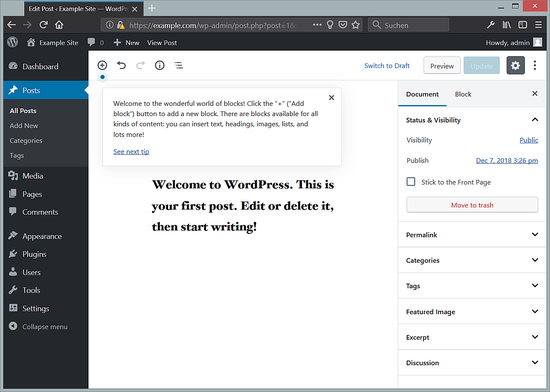 Wordpress, without a doubt, is one of the most popular open-source Content Management System or CMS used in these days for internet publishing, which powers more than 60 million websites worldwide, whether small blogging sites or notable huge name brands. 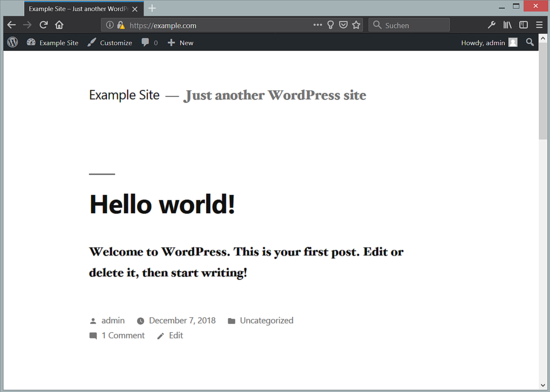 Based on PHP and MySQL engine, Wordpress is often associated with LAMP collection, either installed on dedicated servers or virtual private servers or on shared web-hosting providers. LAMP acronym describes a collection of software, aka software bundle, which usually consists of Linux Open Source kernel, regardless of the chosen distribution, Apache HTTP server, which is one of the most popular open-source web server in internet due to its stability, flexibility and performance, PHP server-side interpreted programming language and MariaDB relational database management system (RDBMS), which one of the most popular database software, forked and simultaneously developed by the open-source community from original MySQL. A clean installation of Debian 9 operating system on a virtual private server or a virtual machine or directly on a dedicated bare-metal machine. In case the webpage should be publicly available in internet you would need a registered public domain name with proper DNS records configured. During this tutorial, we’ll be using the example.com as the example domain and a static IP address from private space, in NAT, behind the main router. The domain will be accessible from the internet by port forwarding the Apache 80 and 443 ports from the router side to internal self-hosted virtual machine LAN. The first thing you want to do before starting to install all LAMP components is to log in to Debian 9 server and perform an up-to-date procedure for all system components, such as kernel upgrades, package updates or security patches, by issuing the following commands with root privileges. In the next step, you should set up the name of your machine by replacing the hostname variable with your own descriptive name by running the below command. Be aware that you might need to reboot the system in order to apply the new hostname accordingly. You should also install the following utilities which will come in handy later for various troubleshooting problems. After the machine hostname has been applied, login again with root privileges and install Apache HTTP server, which is, by default, pre-compiled into a binary package and provided by Debian 9 repositories. Next, install the latest version of PHP language interpreter and all required modules needed for Apache web server in order to deploy Wordpress CMS by issuing the following command. The last component missing now in order for LAMP stack to be complete is MariaDB database server. Execute the following command to install MariaDB server alongside with PHP module required to access the database from Apache HTTP server. After MariaDB database has been installed, start the daemon and secure the database my running mysql_secure_installation script as illustrated in the below excerpt. Mainly answer with yes on all question the script prompts you. Also, make sure you choose a strong password for root account. Be aware that MySQL root account is not identical will Linux root account. The first is used only to manage the MariaDB database and the second is the superuser account in every Linux system. These accounts never overlap in a system. We’re not done with securing MariaDB database yet. By default, you can log in to MariaDB from localhost with the database root account without being asked for a password. To prevent possible security issues, login to the database with root user and issue the following commands. Now, test the database by trying to log in with root account without the password. You should be denied access to MariaDB database. In the next step, we’ll enable and configure TLS and rewrite modules for Apache web server, which by default are disabled. Run the below commands to enable both modules. Then, open Apache configuration files for both enabled sites and add the following block below the DocumentRoot directive as illustrated in the following screenshot. In apache default-ssl.conf TLS configuration file you can also add the below content, if not existing, in order to improve security of Apache SSL protocol. These lines of code should fix common SSL vulnerabilities. For a production website, it should be mandatory to enable Apache TLS module because WordPress CMS generates mostly dynamic content via PHP gateway and also handles the authentication process for its internal users. Using TLS technology guarantees that the transferred information is encrypted at both ends and that the connection is secured. A third-party or a man-in-the-middle can intercept traffic but can not decrypt the content, because the information is not delivered in plain text. After you’ve made all the above changes, test Apache configuration in order to detect potential syntax errors and if everything is ok then restart LAMP daemons in order to reflect all changes made so far and enable the services system-wide by issuing the following commands. Finally, check if Apache and MariaDB services have opened ports in listening state by issuing netstat command and filter the output using egrep By now, Apache web server should have ports 80 and 443 (corresponding to HTTP and https protocols) generally exposed and MariaDB should be only binding on localhost:3306 socket. Use the -n flag against netstat command to suppress displaying service names. To make sure your web server is accessible from the internet via HTTP and HTTPS protocols open a browser and navigate to your domain name. Browsing via HTTPS protocol, a certificate error will be displayed in the browser. This is because Apache default TLS configuration file is configured to use Self-Signed Certificates. You should accept the TLS error and continue navigating to the default web page as illustrated below. In case you cannot visit your domain default web page from the internet you should first verify if some firewall rules in the system are blocking the requests or make sure the proper ports on the router are forwarded into your internal LAN in case the server sits behind a NAT-ed network. You might also want to check the DNS records in your domain registrar panel and make sure they point to your WAN IP and if the records finished propagating on the internet. 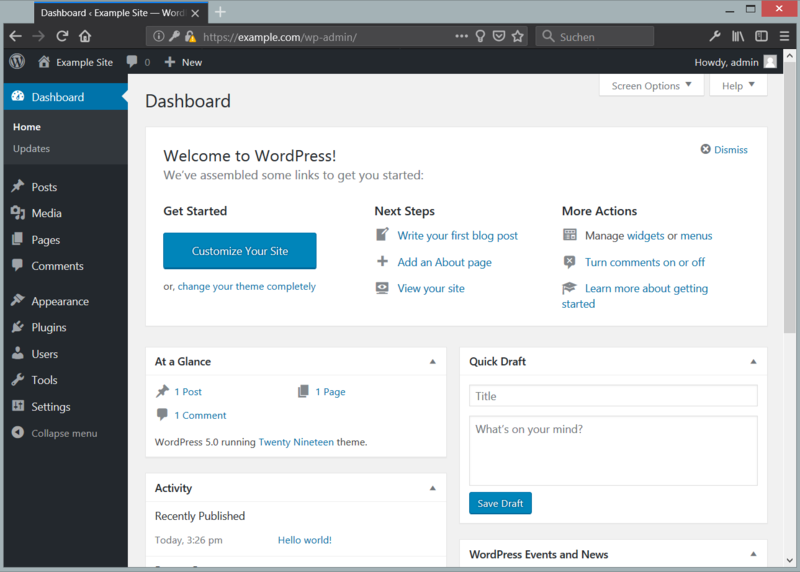 Now that the LAMP stack is fully configured, the installation of Wordpress CMS is relatively straightforward. 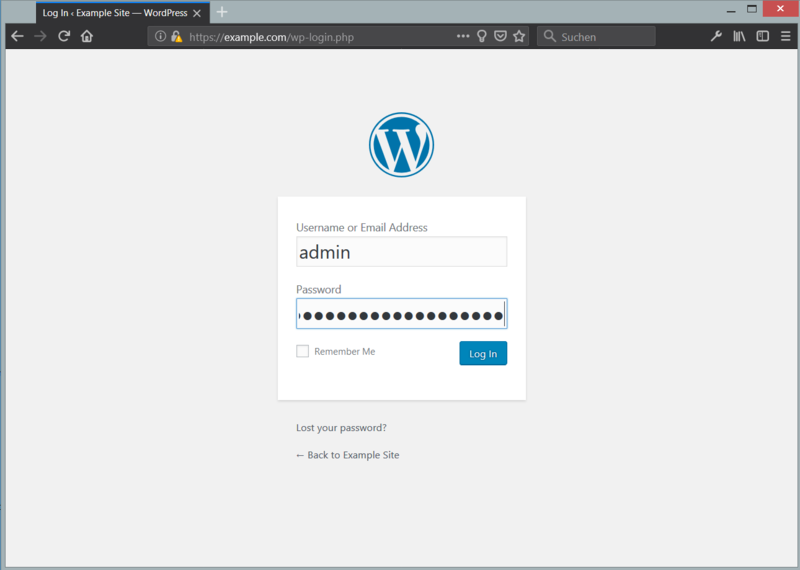 First, log in to MariaDB database and create an installation database for Wordpress and a user with the proper password for installing and managing Wordpress CMS, by issuing the below commands. Feel free to replace the database name and database credentials to match your own requirements. Next, download the latest Wordpress tarball from the official website using wget utility and extract the compressed archive with tar utility. 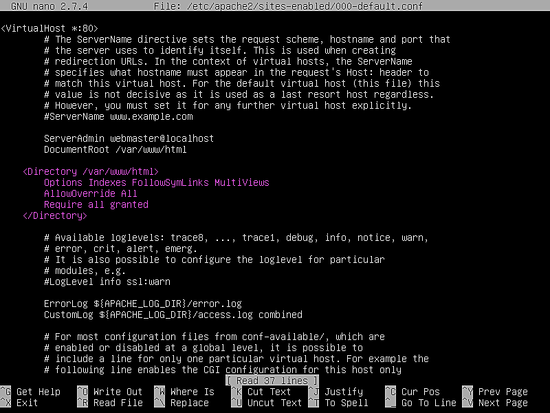 Copy the installation files to Apache web server document root path by issuing the below commands. Also, make sure you remove the default index.html webpage. Modify the permissions of Apache webroot path as described below in order to grant web server www-data group full write permissions to the installation directory. This configuration will allow Apache web server to create or modify files and directories under this specific system path. The most important ones would be the uploads directory and .htaccess file, which can be used to control and extend Apache functionality. Now, that everything is in place, let's start to install Wordpress. The installation process will be performed from the browser. Open a browser and visit your domain via HTTPS protocol. On the first screen of the installation hit on Let’s go button to start the installation. In the next installation screen, add the name of the database, the database access credentials and the database host you’ve created earlier for Wordpress installation and hit the Submit button to continue. 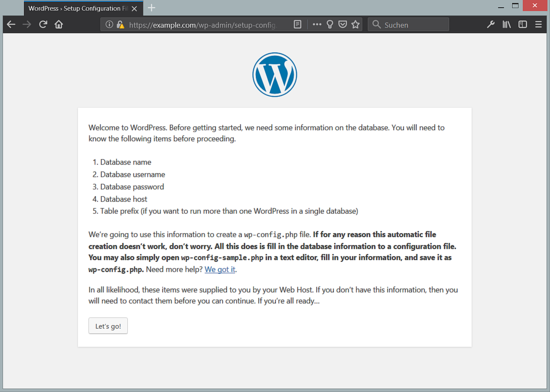 The configuration of the database will be saved in /var/www/html/wp-config.php You can manually modify the file at a later date for special Wordpress purposes. On the next screen click on Run the install button and fill your website title, the website admin credentials, and email address. A strong password should be automatically generated by the installation scripts. You can choose to save this password or provide your own strong password. When you’ve finished, hit Install Wordpress button to complete the installation process. Finally, after the installation successfully completes, log in to Wordpress dashboard with the credentials created during the installation process and start managing your own website. Editing a post in the new WordPress Gutenberg Editor. Wordpress 5.0 Frontend with new TwentyNineteen Theme. Congratulations! You’ve successfully installed the latest version of Wordpress CMS on top of LAMP software bundle in Debian 9, codename Stretch. This user has su rights. Thanks for the tutorial, it's perfect ! Great tutorial, I got it work for me too. For noobs like me there should be also an example how to open ports in the dsl router for 80 and 443 (screenshot for one router, e.g. FB7490). You mentioned it, but how to do is up to the user. But nevertheless great work. I would never get it run without your tutorial. Thanks a lot! 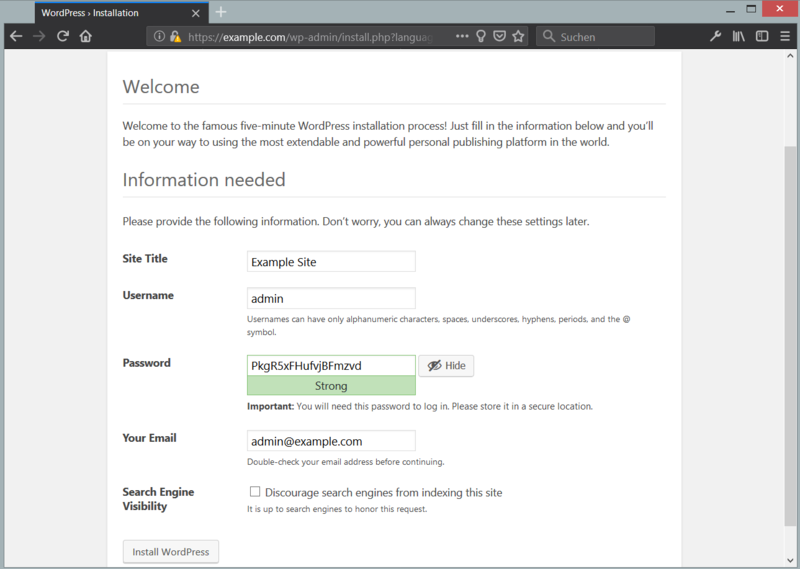 "You won’t be able to install new themes from here yet since your install requires SFTP credentials"
I found a fix on another blog, which I listed below. I'm not 100% if there are any other repercussions to this change, but it definitely fixed the error after the changes. 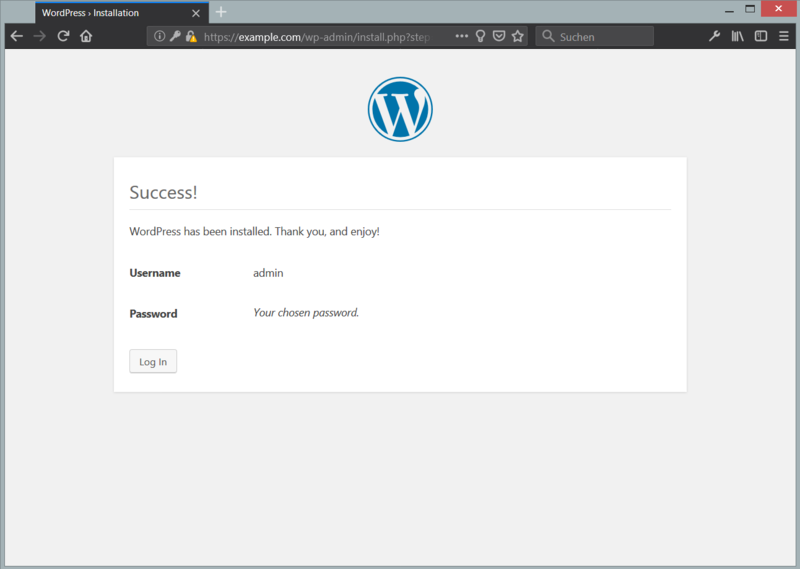 Install WordPress 5 with Apache on Debian 9 as ready to use virtual machine image download in ovf/ova format, compatible with VMWare and Virtualbox.